Various types of car accidents happen each day on the roadways, but head-on collisions are often the most devastating and injurious. These accidents commonly leave victims with extensive injuries that may require years of extensive treatment and rehabilitation. If you or a loved one have been injured in a head-on collision, it is important to seek legal advice as soon as possible to determine the best course of action for your case. You may be able to recover substantial compensation for lost wages, medical expenses and pain and suffering. At the Larson Law Firm P.C., our dedicated North Dakota car accident attorneys diligently work to investigate the circumstances surrounding your accident and develop a strong legal strategy designed to help you get the restitution you deserve. These types of injuries may require multiple complicated surgeries, followed by long-term physical and occupational therapy. A serious head-on accident can keep you from ever returning to work at full capacity. Regardless of what type of injuries you’ve sustained, our experienced lawyers are ready to guide you through the legal process of recovery from start to finish. Whether your case requires savvy negotiations in the conference room or skilled litigation in the courtroom, our legal team has the knowledge and skill to get you compensation for your injuries. Crashes on two-lane roads, with no median between the opposite directions of traffic — one moment of distraction can cause a driver to drift into the oncoming traffic. One car attempting to pass another on a single lane highway, and thus hitting a car going in the opposite direction. A driver falling asleep or becoming distracted and drifting into oncoming traffic. A driver attempting to enter a highway on the exit ramp. Whatever the cause of the collision, our dedicated legal team thoroughly analyzes your accident from all angles to help you understand your options and achieve favorable results. If you’ve been injured in a head-on collision you need an experienced advocate on your side to protect your best interests. 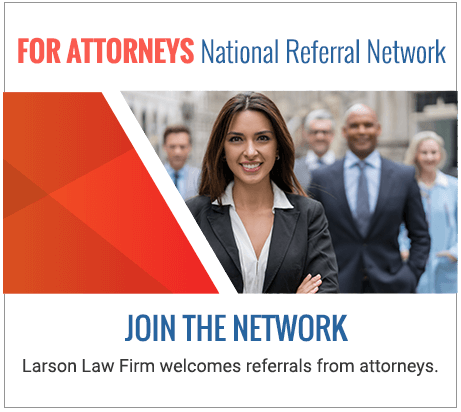 At the Larson Law Firm P.C., our client-centered lawyers are ready to work for the compensation you need for a full recovery. We offer free initial consultations at our office location in Minot, but we also proudly serve the residents of Ward, Williams, McKenzie, Pierce and Mountrail Counties. To discuss your case during a free consultation, call us at 701-484-HURT or complete our contact form today.